Those who appreciate weightlifting will enjoy the Gold's Gym Vinyl Dumbbell Set. This pair of hand weights comes with two tubular steel bars, collars for securing movable components and cement-filled plates. Simply slide the resistance onto the ends of the bars that will best challenge your fitness level and goals to help improve your strength, confidence and health. This dumbbell weight set, 40 lbs is designed to develop strength and definition in arms, shoulders and backs. It can also be used as part of a total-body workout. Squat while holding, use for butterfly chest compressions, curling, pressing and more. The Gold's Gym Dumbbell set follows a model: cement-filled plates that have been a standard in the lifting community for years. 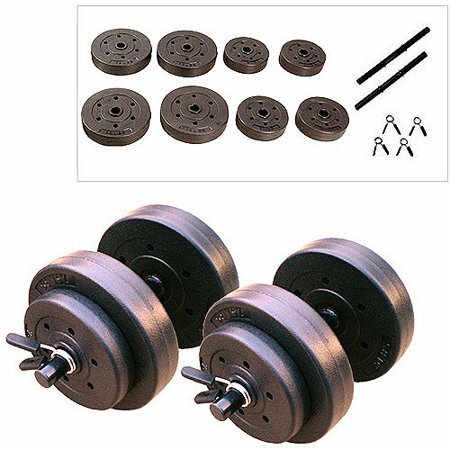 Beginners and experienced lifters alike will find this Gold's Gym Vinyl Dumbbell Set, good for home use and a solution to gym workout barriers. Perfect for arm exercises such as dumbbells rows, dumbbell curls, incline dumbbell presses, dumbbell pullover, dumbbell deadlifts, dumbbell flyes, dumbbell bench press, and lateral dumbbell raises. 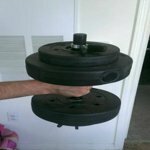 Comes with everything that you will need for basic dumbbell lifting, (4) 2.5 lbers, (4) 7.5 lbers, two bars, and of course, the (4) spring clips. The pricing is amazing, for 20$ for a set of dumbbells, you cant go anywhere else for this kind of pricing!!!! Nice starter set. My boyfriend loves them. My boyfriend wanted a set of weighs recently and showed me these, so I ordered them for him the next day as a surprise. I did site to store and received my order no more than 2 hours later. They are very nice for the price and are a great starter set for anyone. No damage on the product whatsoever upon pick up and are very sturdy. I definitely recommend. I purchased these as a way to work out at home since it's hard to find time to go to the gym (I'm a full time college student and work part time). When I got them in the mail they were in great condition and I recommended them to a good friend of mine. The price for this was awesome and went well with the benchpress that I bought, they use the same type of weights. The weights Are way too bulky for the amount of pounds they way. Awesome price though. I sort of regret purchasing these, but the problems stem from my own stupidity and lack of research. I had assumed that I could adjust these weights in a way that turns out not to be possible. I thought I could use these weights at ten pounds (per barbell) then go up to 15, then 20. I've been using 5 lb weights & 10 lbs is the next logical step up for me. With these weights, however, one must jump from 5 lb to 15 -- I found that to be too difficult for myself. Also, the weights are large and bulky and makes some weight training moves a bit awkward and difficult. Perhaps that is just a matter of getting used to them. In any case, these ARE a good deal if they meet your purposes. Just be advised that the weight plates one receives with this set are as follows: Four 2.5lb plates and four 7.5lb plates. Divide those between too barbells and there you will clearly see your options. 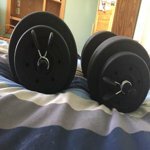 I still plan on using these, albeit, I'll probably buy a set of 10lb weights until I can work up to 15lbs on most exercises. What size are the holes? 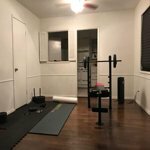 Can I use standard weights from other sets on them? 2. You should be able to use other weights with them If I'm not mistaken 1 in holes is what they have. I would have to speak with my son to be exact but I do know when I brought them it was for 1" in weights. Hope this helps any. 3. I put 25 and 10 pound plates along with the 7.5 weight from this set on the dumbells to do my oblique work out, its a tight fit with all those but it will fit as long as they are not olympic size that you're trying to put on there. 4. the bar diameter is 1 inch, see if your existing bar in the same diameter, but i doubt the spring holder can stop it as well. 6. Standard weights should be 1 inch and Olympic wieights are 2 inches. These are 1 inch. 7. yes, you can use other weights, but the ones provided take up each bar. 6. It comes with two dumbbells. 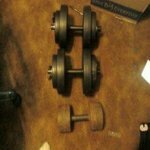 What weights come with this set? 1. Four 7.5 lb weights and four 2.5 lb weights. You would have to buy the 5 lb weights separately. 4. No -- four 7.5-lbs weights and four 2.5-lbs weights, totaling 40-lbs between the two dumbbells. 7. 4 -- 7.5 lb weights = 30 lbs 4- 2.5 lb weights = 10 lbs Hope this helps you . 8. 4- 7.5 lb. 4- 2.5 lb.